A Southwest Research Institute-led team has discovered an elusive, dark moon orbiting Makemake, one of the “big four” dwarf planets populating the Kuiper Belt region at the edge of our solar system. The findings are detailed in the paper “Discovery of a Makemakean Moon,” published in the June 27 issue of Astrophysical Journal Letters. A nearly edge-on orbital configuration helped it evade detection, placing it deep within the glare of the icy dwarf during a substantial fraction of its orbit. 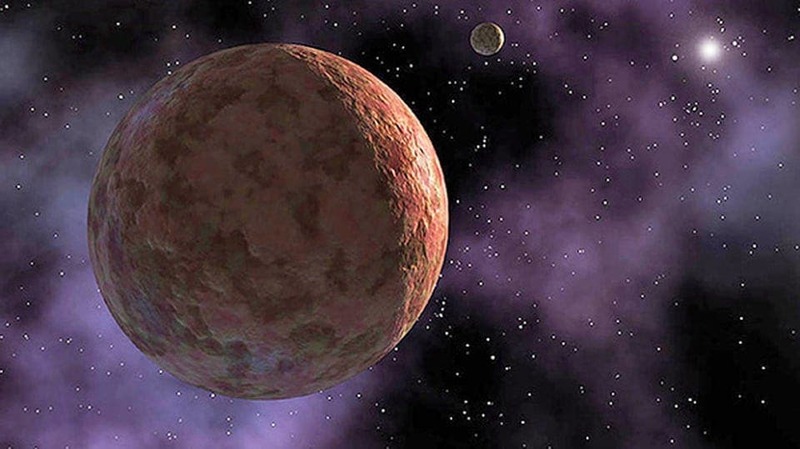 Makemake is one of the largest and brightest known Kuiper Belt Objects (KBOs), second only to Pluto. The moon is likely less than 100 miles wide while its parent dwarf planet is about 870 miles across. Discovered in 2005, Makemake is shaped like football and sheathed in frozen methane. With the discovery of MK2, all four of the currently designated dwarf planets are known to host one or more satellites. The fact that Makemake’s satellite went unseen despite previous searches suggests that other large KBOs may host hidden moons. Prior to this discovery, the lack of a satellite for Makemake suggested that it had escaped a past giant impact. Now, scientists will be looking at its density to determine if it was formed by a giant collision or if it was grabbed by the parent dwarf’s gravity. The apparent ubiquity of moons orbiting KBO dwarf planets supports the idea that giant collisions are a near-universal fixture in the histories of these distant worlds.